The two research teams led by professor Park Se-pill at Jeju National University Stem Cell Research Center and Mirae Biotech succeeded in generating induced pluripotent stem cells using non-viral vectors of nanoparticles and liposomal magnetofection. Non-viral vectors usually consist of DNA that can be delivered to a target cell. The findings were featured in the latest edition of the peer-reviewed scientific journal PLOS One late last month. An iPS cell can be transformed to an infant state that can differentiate into replacement tissue to treat patients with neurogenetic disorders. The type of cell was first created in 2006 by Kyoto University professor Shinya Yamanaka by delivering four genes into a lab mouse through viral vectors. He won the 2012 Nobel Prize for Medicine for the research. Instead of viral vectors that often cause cells to die and develop cancer, the Korean scientists used nanoparticles, a biodegradable agent, and liposomal, which works like a magnet, to deliver genes into an adult stem cell nucleus of a mouse. The iPS cells reverted to their initial type and then differentiated into various cells such as neurons, cardiac muscular cells and cartilage cells. This is the first time that a non-viral system has been developed. Not only is it free from dangerous side-effects, the method significantly boosts the efficiency and shortens the time of iPS cell production, he said. Park also said that the method is simple, hoping this latest development would help his team secure funding to further research stem cell-based therapeutics. The research using iPS cells can bypass ethical questions plaguing embryonic stem cells, which critics deem to be early human life. 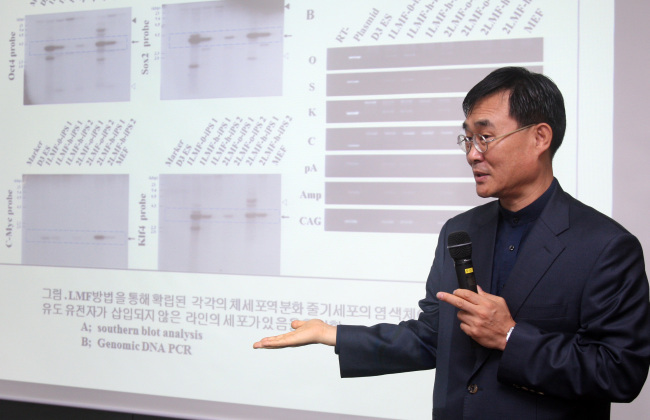 Park, well known in Korea for his animal cloning and embryonic stem cell research, said his findings would boost hopes for developing therapies for patients with nervous system diseases.